If you ask Barbara, she will unequivocally say her favorite breed is the Saanen. For me, it would have to be Lamancha and Oberhasli. Lamanchas are by nature incredibly sweet & intelligent and the absolute cutest little babies. And yes, I’m biased as I think my Lamancha boys, Nicky & Nitro, are the most perfect little goats on the planet. But this past year through baby season and slaughterhouse rescues, it’s become clear, I have a real soft spot for Obers. I have always loved the Oberhasli breed. I’m drawn to their beauty, gentleness and calm demeanors. Obers hadn’t been all that common at the rescue. That is until Team Ober made its way to PSGR this past baby season. It started with two, our very first babies of the season, Remy & Bandito. I was instantly in love and so excited for baby Obers! Then there were 4 more a few weeks later. I took time off of work to be with them all day, every day while Barbara was out of town. Then there was Percy, my sweet, goofy little Percy who was like a little old man in a baby goat body. By the end of the season, 11 Ober kids had come through the rescue, via road trips in my Prius and I had a soft spot for each and every one. This past slaughterhouse rescue I was instantly drawn to a number of Obers amongst the countless number of goats there that day. Winnie was the first. When I entered the pen a number of Obers were around a feeder trying to eat the little bit of hay placed out for them. I reached down and touched the smallest one who immediately turned around and stared at me with these big, bright eyes. A moment that I knew was going to change her life because I knew in an instant, she was being saved that day. Something about this young doe captivated me. She is such a little love; young and innocent and so, so sweet! A few times I’ve caught a glimpse of a sassier Winnie, pushing some of the other Obers around. She is half their size but that doesn’t stop her. However, the minute she sees me, she gives up whatever point she’s trying to make with them for pets and kisses. As healthy and vibrant as Winnie was, Dante, a strikingly gorgeous Ober wether, was another story. He was clearly suffering from the stress and conditions of the slaughterhouse and was so very thin and weak. When we arrived back to PSGR from the slaughterhouse, he ate a few bites of hay, took a big drink of water and promptly laid down and went to sleep. A sleep that had me going over to check that he was still breathing every few minutes. Thankfully, he was. I sat down next to him and lifted his head up into my lap where we sat for a long time. The first few days we continued to be concerned about him and whether or not he could overcome everything he had been through. He received the necessary medical attention he needed, had an all you can eat buffet, and was segregated from the main quarantine herd with a friend so we could be sure he didn’t have to fight herd hierarchy for anything. We did all we could and we waited. Waited and hoped that all our efforts would be rewarded. And they were. Dante is steadily improving and gaining back his health and weight each and every day. Dante now gets to share in the produce I always bring to the farm with me for Faye and I’d be lying if I said I didn’t often slip Winnie a handful of grain. These two hold a special place in my heart. I make sure that every time I go to the rescue I get some time with them. 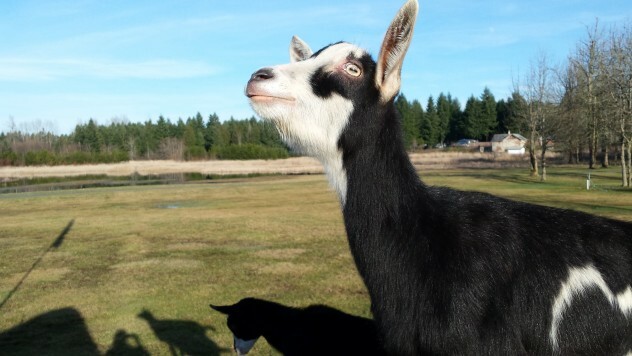 If Baby Goat Central was 10 acres instead of 2.5, I’d be pleading with Barbara to let me adopt them. In just a few short months Team Ober 2.0 will start to make their way through PSGR and I can’t wait to have baby Obers descend on BGC. And when we make our next slaughterhouse rescue you can be sure I’ll have my eye out for Obers. So yes, it’s safe to say that I have a bit of an obsession with Obers. But don’t tell Nicky & Nitro, they are still number one in my book but maybe, just maybe, they’ll have a little Oberhasli sibling or two one day. I will begin by admitting that I fully realize that the significance of this is likely lost on most, if not every person reading this blog. Some have been milking animals for decades. I even know of an adorable two year old, affectionately referred to as “the littlest milkmaid,” who milks goats. Others probably think, what’s so hard about milking a goat, especially if a two year old can do it? Well, in fact, it’s not hard. It just takes, at least for me, some getting the hang of. Over the years we have occasionally gotten in does at PSGR who were “in milk” and were in need of some relieving along the process of drying them up. I had tried, rather unsuccessfully, to milk a few of these does. A few ounces and I was satisfied that I had made an effort and called it good. Leaving it to Barbara who had far more experience. 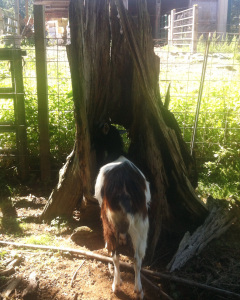 Then last weekend 4 goats came to live at Baby Goat Central. Not our plan but rescue work is nothing if not unpredictable. You learn to go with the flow. You learn, as Tim Gunn would say, to make it work. When 4 lovely LaMancha ladies urgently needed a place to go, we figured BGC was ready enough and moved them in. Elsie, a beautiful young doe was in milk. A lot of milk. Barbara milked her out the first night they arrived. A few days into the week, both Barbara and I in the middle of a busy work week with our day jobs, I found myself late one evening, looking at a goat uncomfortably full of milk and realizing I had to take the plunge and figure this out. I put my arm around Elsie and reached under. After dancing around for a few seconds she stopped and let me start trying to teach myself to milk. She quickly grew impatient with my inexperience and decided it wasn’t worth it and went off to resume eating her dinner. The next night I was determined and bless her heart, Elsie let me have another go. I put an arm around her, fumbled around and then, there was milk, a lot of milk! I was ridiculously excited and Elsie seemed quite content with the results as she started to chew her cud and stood, perfectly still, in the pasture and let me milk her. No stanchion, no lead, no holding on to her; she just happily stood and let me milk her. For me, it was a milestone. One of many on this road of rediscovering my farm girl roots. Of taking on this new phase of PSGR. I had a lot of anxiety of how I would balance my very full time job and all the volunteer work I currently do for PSGR with now adding a barn full of goats to be responsible for. Elsie and the lovely LaMancha ladies have been the perfect transition into this new reality. Yes, I now get up in the dark, at an hour no person should have to get up, so I have time to go out and check on them each morning. I come in for the night, 14 hours later from when I started the day, so I can spend time with them and make sure I am being the best “goat mom” that I can be. I worry about them during the day and am guilty of asking the wonderful neighbors to do a drive by the first few days to make sure they were all accounted for. But this new reality; worry, exhaustion and all, makes me so happy. This is what I signed up for. Sometimes I think diving into the deep end, unexpectedly, is the only way to do it. You just have to let go of the worry of how it all will go, adjust your expectations and make it work. The day after my successful milking of Elsie, I was at work, visiting a pumpkin patch with the kids I spend my work day with and one of them asked what the white stuff was all over my boots. I looked down, not having noticed it before and with a beaming smile I answered, its goat milk! I milked a goat! Every year at PSGR we see lots of youngsters through the rescue. They bring an energy and a life to the rescue that is nothing short of exhausting, entertaining and adorable. We also see a number of young and mature adults who come to us from a variety of circumstances. They know their way around the world yet often have a youthful spirit. Among them, every year, we rescue some more mature does. Does that have most likely been through a lot in their years and who arrive at the rescue ready to relax and ready take on the world to do so. The Golden Girls as I like to call them. Our current cast of Golden Girls is by far one of my favorites. Saffron was part of a June slaughterhouse rescue. I didn’t see her on my first pass by of the front pen, a pen that is the last holding area before animals are processed. But the final time I passed by for one last check, there she was staring at me with those big eyes. She was the last goat in our truck that day. When we arrived back at the rescue she didn’t really want anything to do with us. She was standoffish and honestly, who could blame her. She had given birth each year to triplets for her former owners who then traded her to the slaughterhouse for some pigs and chickens. She arrived back at the rescue, got poked with a number of vaccinations, received a toenail trim and just wasn’t all too happy with us. But as the days and weeks went on, it became very clear to us, she was one of the sweetest goats on the farm. One of the first to greet anyone who enters the pasture, she will stand by you for as long as you will stand by her. She finds people quite useful as a head rest. When we take the herd out forest grazing, instead of feasting on all the browse, she just stands with me, often resting her head on me. She has been one of the biggest surprises with how incredibly people loving she is and I absolutely adore her. One who wasted no time warming up to us was Chiquita. I cannot help but smile every time I see Chiquita. Chiquita was a standout during our last slaughterhouse rescue, following us all around the slaughterhouse and sticking her face in ours. This poor gal was extremely emaciated and her feet were in such neglected, poor condition that she had a hard time walking. I don’t think she has stopped eating since she arrived. Her favorite food, you guessed it, bananas! She got daily maintenance on her feet the first few weeks and she is now getting around without a second thought. She is the first out of the gate every day, always wants to have a conversation and is just one of the coolest goats we’ve had. We don’t know their past stories but if we had to guess, she was likely a dairy goat for many years until she was deemed too old or not producing enough milk and was sent to a livestock auction. We rescued another Saanen doe that same rescue, Athena. Chances are they came from the same place. Athena is much more reserved than her counterpart but she is another sweet, mellow gal that has likely seen a lot in her day. Currently Chiquita rooms at night with Jewel, an Alpine doe from the same rescue who, like her Saanen friends, was incredibly thin and could hardly walk due to the condition of her feet. She is incredibly sweet, follows Chiquita everywhere and has the same crazy appetite. Seeing them devour a bowl of food is a sight to be seen! Then there is Margarite, a goat who cannot be missed. She simply won’t allow it. Forget about the street sweeper brush, she uses anyone who will stand still as a human scratching post. A big, beautiful Alpine, she really is a neat goat. I will admit she drives me a bit crazy at times; she often catches me off guard when she comes up behind me to use me as a scratching post, she wants to be the one and only goat through any gate in case there just might be an apple slice involved and when she doesn’t want to move, she doesn’t move. Albeit stubborn at times, she has a fun, youthful spirit and clearly age has not slowed her down one bit. For most of these lovely ladies, we hope that wonderful adopters come along to give them that perfect “retirement” home they deserve. For some, such as our beloved Faye, that place is PSGR. Faye was one of the first stories I shared on this blog. Faye pretty much has the run of the farm. Sometimes she likes to spend time hanging out in the common area hoping to find the ICU stall open so she can sleep in the small straw filled area in there. Sometimes she’ll find her way into the kid areas while we’re cleaning and curl in their straw filled pools. Do you see a pattern here? She loves her beds. She still gets the pick of the produce from my refrigerator each week, she’s quite spoiled, just as she should be. PSGR just wouldn’t feel the same without our old gal Faye. When I think about these Golden Girls, I can’t help but imagine them as retired ladies who lunch, in pearls and big hats, sharing stories of their years. I can just see them now…..Saffron; the wise one, Chiquita; the excentric, Jewel; always by Chiquita’s side, the voice of reason. Athena; the quiet observer, Margarite; the queen bee and Faye; just sipping her tea taking in a cozy day with friends. A sisterhood. One where after years of being a dairy producer, a brush clearer or a family pet, they were set aside but luckily, PSGR exists to make sure their stories don’t end there. They get to celebrate their golden years with beds full of straw, regular pedicures, friends and all the bananas they can eat! “Do you name them all?” This is a question we are often asked by visitors to the farm. The answer: “Yes, yes we do.” And it’s not always easy. Occasionally a few private surrenders will arrive with a name but a majority of our rescues arrive without names. Some arrive as numbers from auctions and the slaughterhouse and the babies, they never have names. To us, they are individuals and we believe that everyone needs a name. So as part of introducing them to the new chapter in their lives, we name them. We like to give new arrivals names that “fit” them. A name that reflects their appearance, personality and/or their story. A name that celebrates who they are. For some, we instantly find a name that’s perfect. Others, it can take a while. When I first started volunteering at the rescue, being a part of the naming process was very exciting. I spent hours combing through the name lists that Barbara has compiled over the years. I would find and bookmark websites with names from all over the world. I would make lists of new arrivals and name possibilities and run them by Barbara. We’ve found that bouncing names off of each other is far more effective. It’s fun to be creative but 20, 30, goats in each year, it starts to get a lot harder and the creativity gets harder to come by. Especially during baby season when dozens arrive at a time. So far this year, with the busiest baby season in the books, a slaughterhouse rescue and a number of private surrenders, we’ve named over 100 goats. We’re well aware of the fact that many goats get new names as soon as they take their victory walk and leave PSGR. However, in the time they are with us, they have a name that we choose just for them. Just how those names come about, well, just as there are 100+ names each year, there is 100+ ways on how we come about them. Two months ago we rescued a wonderful group of goats from a local slaughterhouse. A small LaMancha doe was the “train wreck” of the group. She was in very poor physical condition; thin, losing her hair, caked in slaughterhouse muck, but this gal was spunky! The slaughterhouse experience certainly hadn’t killed her spirit. She was full of life and clearly had a strong will to live. A few days after her arrival we were still at a loss of what to name her. So I posted her picture on Instagram and asked our followers for name suggestions that represented her spirit; one of a fighter, a survivor. Within hours we had over 80 name suggestions. We sat down amongst the goats and I read through the names. As soon as we read Katniss, we knew that was it. Such a fitting name for this girl! In that same rescue was a sweet Nubian doe, temporarily blind from an eye infection and as thin as could be. She was wearing a collar, one with a name tag. Her name was Greta. But Greta was a name associated with a life that was now in the past. One that cared enough to engrave a name tag for her at one time but not enough to prevent her from ending up at a slaughterhouse. When we arrived back at the rescue, we threw it away. She would now be known as Daphne. We were so happy when Daphne regained her sight a few days later and was able to see her new life. During baby season we’re having to come up with a lot of names. 86 this year to be exact. One of the first groups to arrive was 4 Oberhasli kids that I picked up while Barbara was on vacation out of the country. The smallest had these little pointy ears and an adorable short little face. Immediately I started calling him Gizmo. I know Barbara well enough to know she would have nixed that name had she been there. I tried countless other names but I kept calling him Gizmo. The farm sitter started calling him Gizmo. The volunteers started calling him Gizmo. When Barbara got back, his name was Gizmo. When it came to naming my boys, who I still, and probably forever will, call “The Minis,” no names really stood out initially. These two were always all over the place, into everything, bouncing off of anything they could, moving 90 miles an hour. We thought of something tsunami or hurricane like but nothing fit. Until reading through a list one night in the barn we came across Nitro. As it often does, it just clicked and that was it. We decided to go with another N name for his twin. Nico was settled on when honestly, we had pretty much given up on going through the list again and again, but a few days later Nico just wasn’t fitting. So it was changed to Nicky and their names are now so perfectly fitting that I can’t imagine having named them anything else. With so many kids this year and so many names to remember I had to make signs on each of the baby areas with descriptions of who was who. Cheat sheets if you will. Although that is not always a failsafe. With so many Saanen kids this year it was hard to tell them apart. Despite slight variations in size, facial features or ear size, it was tough to keep them all straight. Especially in the first few days of arrival when we have to monitor who has learned that their milk now comes from a bottle and how much they’re eating. So Kodiak became known as, nail polish on back right foot, Eljin; nail polish on back left foot, Yuki; nail poish on front right foot, etc. Some of our rescues get to bear a namesake of those who have come before them. When Levi, a longtime resident Saanen wether passed away due to old age last winter, we knew one of the kids would be named in his honor this season. The first Saanen that arrived this year was named Levi to carry on the legacy. We could not have picked a better namesake for Levi. I am still waiting for a special little doeling to come along to carry on the namesake of our beloved Mia. Whether their name is one that has a long story or one that is simply “just because it fits”, they are no longer an auction number, no longer one in a hundred babies born on a dairy or waiting to be sold for meat. They now have a name and a new life ahead. It is always a relief when all the current residents of PSGR are named. That is until another new arrival comes through the gate and we look at each other and say “we have to think of a name” and once again it's time to play the name game. After weeks on the roller coaster that is real estate, PSGR now has a new, additional location! Just a few miles from our main location, the rescue will now have a smaller, second location that will enable us to continue to take in babies in the numbers we did this year. A total of 86 rescued kids rounded out the 2015 baby season at PSGR. In order to sustain those kinds of numbers, we needed some additional space dedicated to kids. 2.5 acres with blackberries, fresh browse and a big barn, it’s an ideal spot. We’ve been hoping to make this idea a reality for a while, and now it’s official, we have a new baby goat central! The new baby goat central also comes with a darling little house that will be my residence. After over a decade of living in the city, I’ve been yearning to return to the farm life I grew up in. To go back to the country where things are a little simpler and a lot more peaceful. A place where I don't share walls with neighbors, where I can be surrounded by goats and a place where I truly feel at home. There is so much to do at the new location. Not an inch of fencing exists yet. There is so much to plan out and as life on a farm, and in rescue work, is always filled with the unexpected, there will be a lot of figuring it out as we go. But we have a dream for PSGR, a dream that will be accomplished one day at a time, one step at a time. This is a big step in the direction towards the realization of that dream. As I pack up my city apartment, I think about how 5 years ago, I would have never imagined myself moving back to a farm in the country. Today, I can’t imagine myself anywhere else. Because, sometimes on your way to a dream, you get lost and find a better one. It’s that time of year again when countless bottles prepared each day become just a few and we start to put another baby season in the books. It has been one of the busiest baby seasons the rescue has ever had. 79 kids have come to PSGR this year to find their forever homes. Over 35 have already graduated and are off to the next chapter in their lives. Last year I said that the 2015 kids were going to have some big shoes to fill after last year's group of kids. Well, did they ever! This baby season has been long, busy, challenging, and exhausting to say the least but it has been one of the best! One of our adopters recently asked if adoption days were sad days or happy days. My answer was that it was both. We’re always a little sad to see them go. They often arrive just days, if not hours, old. We become their world and they become a central part of ours. But it’s a happy day to see them go on to get a chance at the life that they deserve, to see the happiness and life they bring to their new homes. It’s why we put so much into making their lives possible. This guy sported a couple different “outfits” before we found the right splints to help correct his contracted tendons. When we found the perfect fit, he sported some Seahawks spirit. These days he’s out of his splints and doing great in his foster home! Bolt mastered all the play equipment in record time, not to mention anything he could climb on including his 2 legged friends. Running, jumping, kicking; this little guy is a true athlete. They’ve held this title from the minute I laid eyes on them. Their big personalities are as adorable as they are and their presence around the farm is unmistakable. Always entertaining and wagging their tails, these little love bugs are always cute as can be! “Who is that screaming?” "Mack." The answer to that question was almost always Mack. Nothing was ever wrong, he was just a bit of a fan of the dramatic. Super sweet and sensitive, this big guy always had a lot to say. His eyes will instantly melt your heart. Not to mention, he is quite a good kisser. He doesn’t nibble or chew on you; he just wants to give you butterfly kisses and gaze into your eyes. Hands down this little lap baby takes the cake on this one. The day he arrived he crawled into my lap and took a nap and since that day, it is how we spend most of our time together. He appears at my feet and I can never resist that darling little face. I pick him up, he stretches out, settles in and is asleep within seconds. Everybody loves Tigger! How could you not with those cute little LaMancha/Nubian ears and those long eyelashes. He wants to be everyone’s best friend and often takes on the role of escorting people to the gate as they leave and making it hard for anyone to leave without him. 11 Oberhasli boys made their mark at PSGR this year. A varsity team of 6 followed by a junior varsity team of 4 and in between there was Percy, who having grown up with “the minis," thinks he’s a bossy Lamancha. This team of kids proved just why we love Obers so much; beautiful, fun and gentle. They’ve cemented a place at PSGR for generations to come of Team Ober. Don’t tell Rocket but he has an apprentice. Gentle, quiet and the sweetest of temperaments, like Rocket, Flash would rather be with his people than with the other goats. He loves being curled up at your feet, chewing his cud or having his cheeks scratched. He is a very handsome boy and a farm favorite of many. Watch out Rocket! Each and every one of the kids this season touched us in their own way. We are honored to be where they come to grow up. They are a part of the PSGR family, no matter how long their time with us is. Here's to the 2015 class of PSGR kids, a group that certainly made their mark in PSGR history! Yesterday was my maiden trip to the local slaughterhouse to help rescue, firsthand. I’ve been volunteering with PSGR for a couple of years now and have submerged myself into all that our work entails but I had yet to accompany Barbara on a slaughterhouse rescue. For a while, I wasn’t ready. Not that I think one can ever truly be ready to witness animals on death row at a slaughterhouse. I know myself well enough to know that for a long time, I just wasn’t ready to go there. Luckily, the need never arose for me to do so. As I learned more, experienced more, understood more and not just in my head but in my heart, I decided that when I was needed, I was ready to go. Yesterday was that day. In some ways it wasn’t as bad as I had imagined. In other ways, it absolutely was. Throughout the day I posted photos of our rescue on our fastest growing social media account, Instagram. The response was overwhelming and immediate. I was so clearly reminded of what amazing people there are intertwined in the world of goats and animal welfare. This past year, through our various social media accounts, I have met, both in person and virtually, some truly inspiring people who all share one thing in common; a love of animals and a desire to make the world a better place for them. A few months ago, I had the privilege of attending a dinner with Gene Bauer, President and Co-Founder of The Farm Sanctuary. A man who years ago, sold veggie hot dogs outside of Grateful Dead concerts to fund farm animal rescues and was a pioneer for farm animals in countless ways. 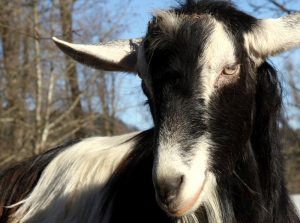 Today, he continues to put farm animal welfare in the national spotlight. I had the pleasure of meeting Matthew Dominguez, Public Policy Manager for the American Humane Society of the US. A man who is motivated, like no other, to fight for farm animals. Farm animals, who are often forgotten in a world that when it comes to animal rights, focuses more on companion animals. Every single day he is on the front lines fighting against AGAG bills, traveling the country and demanding a voice for the animals. This past winter I fell in love with the stories and photos of some animals rescued from one of the worst animal cruelty cases in New Jersey’s history. For weeks, I sent words of encouragement and kept up to date on how they were doing through Instagram. Today, goats Ansel & Petal, calf Lilly and so many others, because of the caring people who invested in their recovery and care, have turned their tragic beginning into an incredible story of resilience and hope. They are helping shed light on the farm animal cruelty that happens every day in our world. There is a kindred spirit amongst us all. The rescuers, advocates and sanctuaries who take to social media daily to share the story of our animals and raise awareness of the plight many farm animals face. Together, we reach millions of people. We touch lives, we help educate and are in turn, inspired and humbled. The messages that poured in yesterday, from strangers, all over the world, were incredibly touching and motivating. Witnessing what I did yesterday, was heartbreaking, but we saved 13 lives. It may be just a drop in a much bigger ocean but it’s something. I believe that together, all of our drops can make a pretty powerful impact. Whether you’re on the front lines pushing for accountability for farming practices or simply sharing pictures and stories of rescued animals; whether you’re rescuing from the trenches of cruelty cases and slaughterhouses or adopting rescued animals of your own; we are all in this together. Each and every one of us is invested in these four legged friends that need our help. I’m honored to be a part of this community and when it’s time to go back into the trenches, you can bet I’m going right back in. I’ll be doing so knowing I have a pretty awesome group of people behind me. 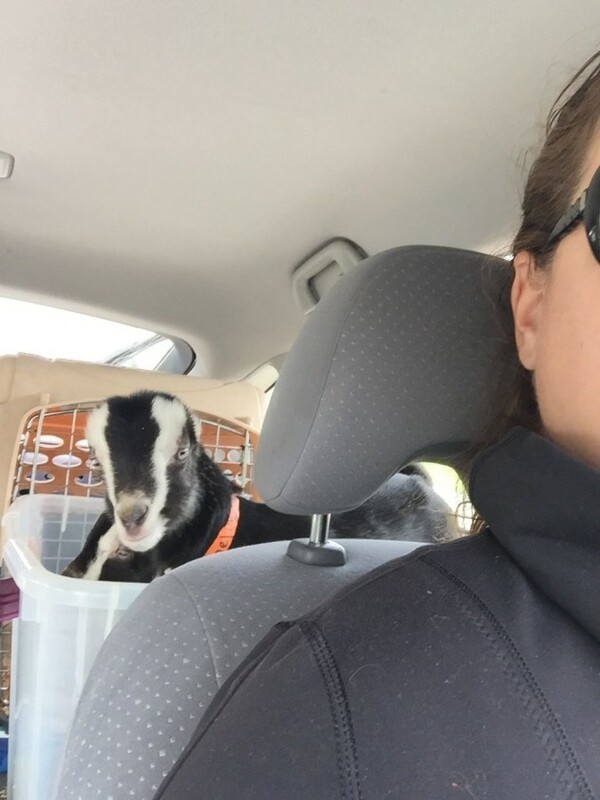 Earlier this week I took yet another baby goat road trip. It was a picture perfect day to take a ferry ride with two perfectly behaved little goat passengers. This trip was different from the many other baby goat road trips I’ve been on this season. This one completed a circle. The two kids made a similar road trip with me in March to the rescue. They spent two months at PSGR warming our hearts, entertaining us with their big personalities and being part of a great start to this year’s baby goat season. This trip delivered them to their new lifelong home with an amazing new family. The circle was complete. It’s been a busy few months to say the least. Over 70 kids have come through the rescue so far this season to find their forever homes. Thousands of miles traveled to insure they are saved. Hundreds of gallons of milk purchased. Countless hours of measuring and filling bottles, feeding babies then washing bottles just to turn around and do it again a few hours later. Hundreds of volunteer hours to help lessen the burden of work on Barbara. Thousands of dollars in vet bills to save those who needed a little extra help. We’re exhausted. We’re often running on empty. Our respective houses are a bit neglected. A home cooked meal is a rare occurrence. My car has become a weekly baby goat and milk hauler. But all things considered, it’s been a pretty amazing few months. Seeing the joy two little rescued baby goats brought to their new family, completing that circle; this is why we do what we do. This is why we sacrifice sleep, a social life, vacations, and pretty much anything not related to rescuing baby goats for these couple of crazy months. This experience, this outcome, this is what it’s all about. Yes, there are the moments when excited baby goats spill a bucket of milk, evenings when it takes forever to get them all out of the pastures and sorted into their appropriate places for the night, days spent pleading with a hungry baby to realize his milk now comes from a bottle. Moments that sometimes make you just want to sit down and cry from sheer exhaustion and frustration. But these moments never dull our passion and commitment to the work that we choose to do. For there are also moments when we just get to simply be with the kids; one on our lap, one curled up on our feet and a dozen more within an arm’s reach and realize that they may not have had this chance at life if not for us. There are days when we get to complete the circle of the work we do and see them off to the next chapter in their lives. All of these moments make the life that is rescue work. It’s a life that comes with sacrifice but it’s a life I wouldn’t trade for anything in this world. My love affair with "the minis" began within the first few moments I met them. These adorable twins were 2 of 14 breeder cull kids from a dairy, who made a couple hour journey with me to the rescue back in March. As it often does, the numbers for this kid pickup increased last minute so I slipped two plastic laundry baskets into the car for the 4 newborn goats. While loading up the kids I put the youngest two in one basket and the smallest two in another assuming they were the other set of newborns. A few miles down the road, I began to question my assumption. We got on the road and everyone settled in as they usually do, except these two. They were up, looking out the window of the car (what the people in cars next to me must have thought) they talked, a lot, especially the smallest one. I chatted with them, reassuring them they were going to be ok, they were off to the good life. The talker took that as an invitation to try and join me in the driver’s seat. Luckily the basket was tall enough that they couldn’t get out but that didn’t stop him from trying to chew on my hair, bump me for milk and being the cutest backseat driver there ever was. It was clear that these two, now named, Nitro and Nicky, were bound to be two of the biggest personalities on the farm. Their first week with us they both fell a little under the weather but their feisty personalities served them well and they recovered quickly. During their recovery they needed constant monitoring however so they were granted overnight house goat status for a week. Nitro became a space heater worshiper. They were quickly back in the barn at night and spending their days out exploring and grazing and being the cutest little Lamanchas. They are as energetic and entertaining as can be. They are also little love bugs, happy to spend the day in my arms, chewing their cud and watching the world around them. They are still two of the smallest kids even though now they are two of the oldest. They are not a miniature breed, they are purebred, standard size Lamanchas. I just affectionately refer to them as "the minis" not only because of their size but because they are also miniature versions of a number of other Lamancha kids currently at the rescue. 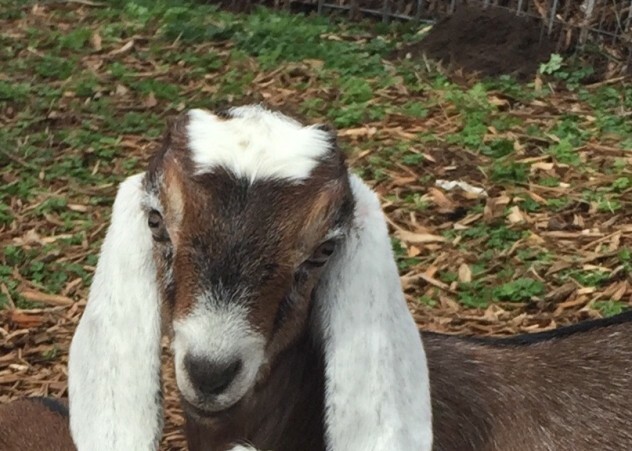 The smallest goats often have the biggest personalities and these two are no exception. Their air-sucking routine, we could take that on the road! They now even try it with me when I'm holding them, pressing their cheeks against mine. They’ve recently learned they can jump straight up in the air, it is their new favorite playtime activity. When not in my arms they love to nap on the stanchion. One at a time, not allowing any other goat to join them. Like I said, little goats, big personalities! They have a tight sibling bond, however they have welcomed little Oberhasli Percy into their close knit family unit. Percy arrived as a single baby, a little guy as well and we were having a hard time finding the right group of kids for him to join. The minis have been the perfect fit for him. His mellow demeanor seems to be a good balance for the crazy duo. They are quite the charming trio. It never fails that every year, some just take a hold of my heart from the get go. This year, "the minis" have me head over heels in love. Rocket. You all know him. We all love him. And these facts, well, they have started to go to his head. It didn’t take long after his arrival last spring as a bottle baby that we realized Rocket was something special and he quickly cemented a very special place in the hearts and lives of myself, Barbara and other members of the PSGR family. It also didn’t take long before Rocket himself realized he was something special. Admittedly, I have certainly had a hand in inflating his ego. Rocket pretty much has the run of the farm. Upon seeing my car drive up and hearing my voice he makes his way to the gate and talks to me until I let him out to the main area of the farm. He often accompanies me in everything I do. Literally everything. Everywhere I go, there he is “helping”. Helping includes getting into everything, leaning on me, getting in the way of anything I try to do, chewing on my zippers and simply staring at me with those big puppy dog eyes. When I want him to go back out with the goats he acts like a toddler; he doesn’t listen, he looks at me like I’m crazy and goes back to whatever it is he wants to be doing. When he is amongst the other goats it’s near impossible to pay attention to or brush any other goat, the minute Rocket sees it, he will wedge himself in the middle and there he stays. When this year’s new bottle babies started arriving at the rescue he was less than thrilled. He goes around to all the baby feeders and eats their hay from the other side of the fence, just because it’s theirs. If I’m sitting holding a baby and he is the same area, he will often come up and try and bite the baby and shoo any babies near me away. If I’m in a baby pasture he lays at the fence and stares me down. He has had to learn to share the spotlight which is not a lesson he has been happy to learn. Yes, he was on local TV weekly during the NFL season wearing his Kam Chancellor jersey supporting the Seahawks and he won a local Santa’s Favorite Pet contest by a landslide. Most people who visit the farm know who he is without having ever met him and almost every family that has come to adopt goats would have chosen him in a heartbeat if he didn’t already have a permanent home with us. But these things aren’t what make Rocket a star. What makes him a star is he’s just simply Rocket. When you meet him you just get it. He’s pretty special. Yesterday while the main herd was out grazing I sat down in the pasture to spend a few minutes with Harmony, a sweet mini Lamancha doe and within 10 seconds guess who was there pawing at me? So there Rocket and I sat, he leaned on me and chewed his cud. Best friends watching the herd enjoying a break from the rain. Yes, his diva like behavior drives us crazy sometimes but hey, someone has to be the star. It is the nature of rescue work that the rescuing is only the beginning of saving some of the animals that come into our care. In Barbara's 10+ years of doing this, she has seen a lot. Each year we see animals with familiar and unfamiliar ailments. One thing remains the same however, we do absolutely everything in our power to save them. No matter what the cost. Because not only do these animals deserve a second chance at life, they deserve for someone to fight for that chance to be possible. When lamb Callie was literally dropped off at our front gate after being spared by a meat buyer because she was too small and ill, we knew we were her only hope. Her prognosis wasn't great. Even if we were able to manage her joint infection, vets believed she would be permanently crippled. Regardless of what her prognosis was, Callie deserved the best possible care we could provide her. She deserved for someone to care enough to try. Treatments were started immediately and incredibly generous and talented volunteers fast tracked designing and building a cart for Callie to assist her during her rehabilitation. Today, she has made a truly amazing recovery. She beat the odds and shows no lingering effects of her joint ill. She arrived terrified of anyone with two legs but with a lot of TLC, even when she wasn't sure she wanted it, those days are long behind her. Medicine is not the only thing in the world with healing powers. The first of our bottle raised kids started arriving back in February, an exciting but always cautious time, as their health is often fragile as they grow and develop immune systems. Boo had only been with us a few days when Barbara went out to the barn one morning to find him collapsed. The days that followed included an emergency vet hospital visit, multiple vet consultations and 24/7 care and monitoring. Barbara dropped everything to care for Boo, volunteers came on last minute notice to stay with Boo when Barbara needed to work and there was nothing that wasn't done to save him. Today, he's bouncing around playing with his friends and escorting everyone to the gate when they leave. Boo didn't have much fight in him that first week of his recovery, he needed to be fought for, and that is exactly what we did. There is a lot of time, energy, emotion and money that is put forth to save animals in all stages of health at PSGR each year. Every bit of it is worth it. There is no greater reward than seeing Callie out grazing as far in the fields as the fences will let her, when she could barely walk just 2 months ago. To see Boo frolicking and racing around the pasture then curling up with his best bud Vespa for a nap, when just a few weeks ago he was too weak to even hold his head up. There are so many things we have to consider and make decisions about on a daily basis in regards to the work that we do. When it comes to saving our rescues, there are no questions. We do whatever it takes. Boo has made a full recovery! Loki and I last weekend, I love that boy! I recently received an invitation I could not refuse, to go visit 4 of my favorite bottle baby boys from last year. With new kids arriving weekly at the rescue, I often find myself wondering how last year's kids are doing. We bring these little ones in just days old, bottle raise them and find them the best possible home. We become invested. We often hear how they're doing shortly after their adoption but rarely do we get the chance to see how they're doing a year later. To see firsthand how their lives have been changed since graduating from the rescue and how they are changing the life of the family they have joined. Milo and Zuma (now Oden) were some of our first kid arrivals last year. Two of a group of crazy affectionate and entertaining alpines. When prospective adopter Robin came to visit the rescue to meet the herd and select her new four legged family members, it was clear to us that whomever she selected was going to have an amazing home. A few weeks later Milo and Oden went home with Robin. We received occasional updates and pictures and kind words from Robin about how with goats now in her life, she was living her dream. Today, the 4 boys are living in goat paradise. 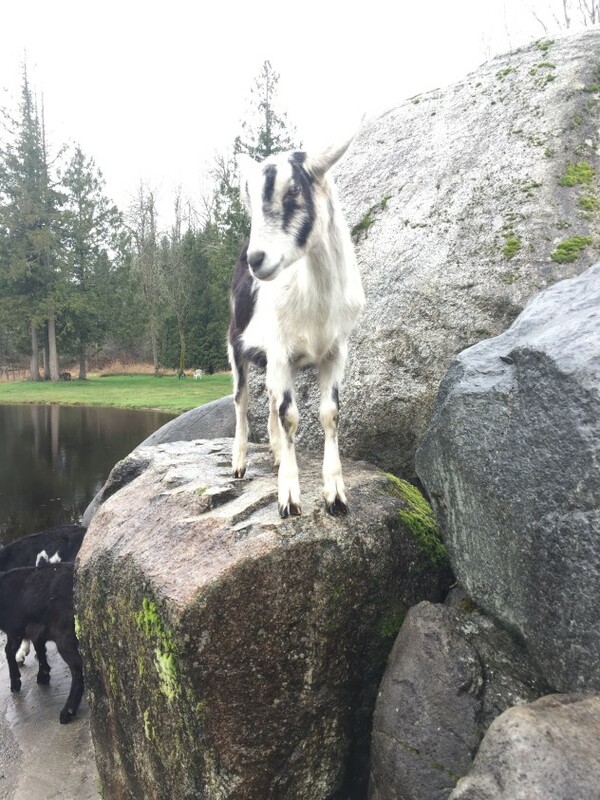 15 acres, rocks to play on, forest trails to explore, a huge barn complete with goat bedrooms with sleeping platforms and a mom who loves, spoils and simply adores them. It is clear that not only has Robin given the boys an incredible home, they have given just as much to her in the joy and peace they bring. Seeing the boys so happy, healthy and wonderfully cared for, absolutely made my day. Not to mention loving on all of them and getting Loki kisses. It strengthens my resolve for the work that we do. Despite all the ups and downs that come along with rescue work, this is what it's about. People like like Robin who seek out rescues, who choose to adopt. The second chance we and our adoptive families get to provide for these innocent lives that otherwise would have faced an unknown future. I cannot thank Robin enough for inviting me to spend an afternoon at her farm. If I had a crystal ball, I'm willing to bet I'd see more goats in her future, I certainly hope so. I'm up for another reunion with those boys any day and any goat that finds a home with her is a very lucky goat. To help us make the same kind of future possible for this year's littlest rescues, please consider joining our kids club. A one time $25 donation helps PSGR to rescue, care for and re-home our youngest rescues. It's been a month since I've posted a blog entry, a time frame I told myself I would never let happen. But I've come to the realization that there is no "slow" season at PSGR. The last month has been filled with lots of adoptions, new volunteers, a website overhaul, marketing & fundraising plans, social media mania, networking, work party planning and of course the day to day care of the ever changing herd at PSGR. All while we work full time jobs away from the rescue. 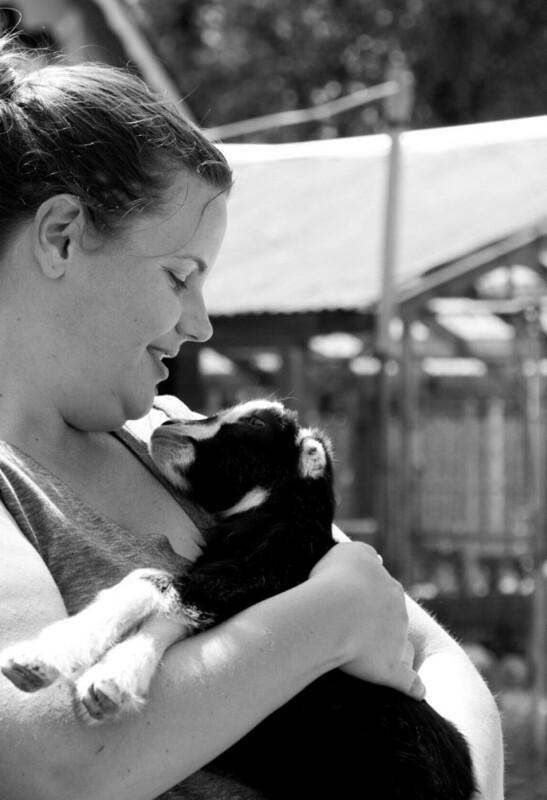 Regardless of whatever it is we're doing, every day is a good day when you're working to care for and save goats. No matter how busy we get with everything else, the heart of what we do is save lives. Amongst all the busyness of the past few weeks, we've had quite a few new arrivals. Today, I brought 4 new babies to the rescue. It was a long 11 hour day. As I said goodnight to all the animals and turned off the barn lights I realized that days like these, new arrival days, they are quite possibly the best days. For me, there is an excitement whenever we get new arrivals at the rescue. No matter where they come from, be it the slaughterhouse, breeder cull kids or private party surrenders, there is the promise of a better day for them. No matter what their past, we get to provide them with the best possible future. That feeling, it's pretty amazing. It's heartwarming, gratifying and maybe even a little magical. The joy and the satisfaction it brings, there is nothing quite like it. Tara, our newest slaughterhouse rescue has fit right in like she's been with us forever. The Toggenburg girls, Kit and Kat, who arrived a few weeks ago shy and unsure, followed me around today to see what might be in my pockets. They have even joined the top of the picnic table napping rotation. The babies all took turns being snuggled up in my coat, taking comfort after a day full of change. Just like every new arrival, their realities are changing. But that is a good thing. Their new reality will be void of uncertainty. It will be full of what we wish for every goat, for every animal, love and comfort. We get to do that. We get to make that difference for them. Every time we get new arrivals, it brings new hope, new life and those days are simply the best. NW Washington is electric right now. The city of Seattle is literally lit up in blue and green and sporting the number 12. A city, a community, saying "I'm in." Why? Because we believe. We believe in a team that many critics thought wouldn't amount to much. A team that is largely made up of third, fourth and fifth round draft picks and undrafted free agents. Players, many didn't believe in. Players, many didn't think had what it took to be stars in the NFL. Players, many didn't think were good enough. At PSGR our barn is filled with goats that people didn't think were good enough. Goats that for whatever reason, were thought to be worth nothing more than to be sent to slaughter. But that's not what we see. To us, they are amazing. Each their own personality, each bringing something different to the herd. Each worthy of love, security and care. Worthy of someone believing that they are good enough. To be given the chance to simply be themselves. It may seem crazy, to some, to see goats in jerseys and cheerleading outfits supporting a local football team. But to me, it represents a spirit. A spirit of overcoming and perseverance. A spirit of seeing worth and value where others see none. A spirit of believing. So from a barn full of goats who were cast aside, now getting a second chance at life to a team who many critics never believed in, now on their way to a second straight Super Bowl, we believe! "There is no greater gift you can give or receive than to honor your calling. It's why you were born" -Oprah Winfrey It's hard to believe another year has come and gone. For me, personally, 2014 will be the year that I truly discovered what I am here to do. To help save animals. A discovery I feel lucky to have made. The other day, in a stall of the barn sitting with a couple of the goats, I had a moment. As tears filled my eyes, lost in a moment of thinking about the loss we have experienced, the sadness of what wasn't meant to be this year, I was reminded in that same exact moment of all the good we've seen and done. The lives we saved, the progress we made. Lost in my moment I was brought back by a cry from the next stall over. It was Rocket. Who seeing me sitting down, took it as an invitation to come hang out with me but there was a gate in his way. He made me smile, he always does. I turned to see Luna laying next to me. Luna, a goat who has taken up more and more space in my heart in the time she's been with us. Likely a retired dairy Saanen, sent to auction, pregnant, purchased by a slaughterhouse, rescued by us and now being completely spoiled. It reminded me of all the goats and sheep, young and old, who came through the rescue this year; how entertaining, loving and innocent they are. How hard it was to see them go but how heartwarming it is to see how happy they make their new families. The spring that brought countless breeder cull babies bouncing around the barn, bright eyed and full of energy. The summer that was so hot none of us, 2 or 4 legged, wanted to even move. (We are wimpy about heat in the NW) How the goats were sunbathing in pools in October and just a month later how the whole place froze over and the goat kids experienced their first snow. I remembered the goats who we didn't think would survive after what they had been through only to see them recover, thrive and find their lifelong homes. The goats who were so shy and apprehensive upon arrival who now love attention and seek out a scratch on the cheek. The numerous photo shoots with amazingly tolerant goats that had us all laughing. The rescues where going to rescue 5 or 6 goats turned into 18 goats coming back. I was inspired by this place and Barbara's work and it's led me to help bring a fundraising and social media presence to the rescue. We were humbled by the support both monetarily and simply by words of thanks and encouragement. The love of goats is truly a powerful connection. That moment the other day was a time to reflect, accept and move ahead. Because just as so many lives depended on us this year, so many more will next year. I got up and went about what needed to be done. Rocket and Luna reminded me that the good outweighs the sad and I have been given a gift. And the best thing I can do is share that gift and help prepare PSGR for whatever 2015 has in store. I also wanted to say a heartfelt thank you to everyone who has taken the time to read this blog these past 6 months. I have truly loved being able to share the stories of PSGR with you and can't wait to share our adventures of 2015. Happy New Year! "My love for animals, particularly those needing homes, began as soon as I could walk. I remember a picture of myself as a small child holding a tabby cat underneath its forearms as the cat dangled down in front of me, almost as long as I was. I grew up on an acre with a small barn in our backyard, which, over time, I turned into a sanctuary for stray cats, rescued rabbits, injured birds and a stray boxer dog. My first experience with a goat was with a neighbor that had a large Saanan. I thought this goat was really cool and I even got to take care of him for a few months. I always knew that someday I would want goats. Having three brothers who were so involved in organized sports, this barn was where I spent most of my afternoons after school. My parents had an idea that there were more than just my two horses living in that barn but turned a blind eye and let me pursue my passion for saving animals. 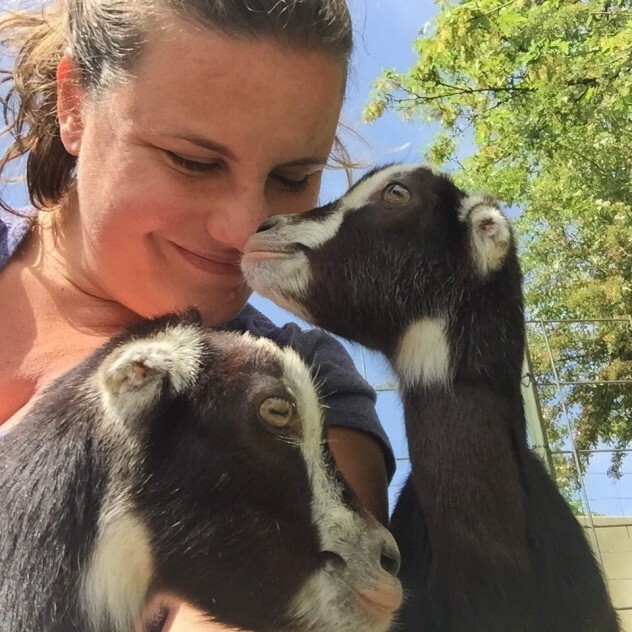 After marrying, having four kids, and living in West Bellevue for a dozen years, I really began to miss having animals and convinced my husband to get goats. We adopted two pygmies and then soon acquired chickens and rabbits as well. It didn’t take us long to realize we needed more space so we bought a house on six acres in Sammamish. I was thrilled! Over the last 15 years, I have created a rescue farm for homeless animals called Second Chance Ranch. We have adopted, fostered and rescued cats, dogs, alpacas, llamas, horses, bunnies, and of course, goats. This year we even took on a large steer that many wanted for meat. He is as sweet as can be and brings great joy to the neighbor kids who come to the bus stop early each morning to bring Cowboy carrots. I get such a great feeling of fulfillment when I look over my pastures and see the once neglected goats climbing the rocks, the alpacas chasing and playing with each other and the kids visiting daily to see Cowboy and the farm. Sharing the farm and teaching children to appreciate and care for these wonderful animals is very rewarding. 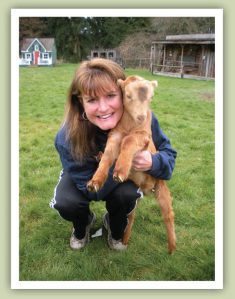 I met Barbara, founder of Puget Sound Goat Rescue about 12 years ago when I was looking to adopt a friend for my elder goat. I have fostered many of Barbara’s rescues and have adopted goats, alpacas and Cowboy the steer through her. 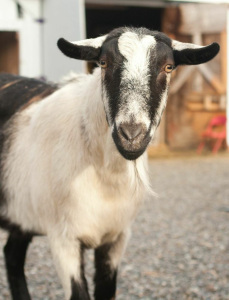 I think of Barbara as the Goat Angel as she has such a heart and commitment to saving these sweet pets. I have been on the PSGR board since the beginning and have enjoyed all the wonderful members and volunteers that have contributed to this passion. My daughter, Julie, also has acquired this love for neglected animals; in particular, cats. She fosters and rescues cats missing tails, an eye, teeth, and senior cats. But they are never missing hearts and the ability to reward her back with their love. Julie and I recently started a business called Unplug and Create. We make activity boxes for children that also incorporate our love for our rescues. Each box has rescue trading cards featuring the various rescue animals living on the farm or foster animals we have worked with. It also has short stories about the rescue of a particular animal and shows actual photos of that rescued animal. The boxes have pictures around the outside of our special pets. The five activities boxes have different themes: Farm, Garden, Write-On, Sport, and Spy. All introduce kids to the rescue farm. In addition, I have begun to write and publish children’s stories about rescued pets from our farm. As a child, I wrote stories and poetry, often inspired by my work with animals and I always knew I would like to write books one day. As our youngest graduates this year from college, I have begun to fulfill this dream. So far, we have four books in what I call, “The Rescue Series”, and two more in the works. These books are thetrue stories of a rescued pet, told by the pets themselves. At the end of each story, I have added actual photos of that animal, making the story very real to the child. Kids and adults alike have shared their love of the books and have given them great reviews. Although my books and our business is not a non-profit organization, it does help us fund the ranch and give to the goat rescue, where I have found Barbara and other special people and volunteers. We truly can not thank Diane enough for all she has done and continues to do for PSGR! We are lucky to have her as a part of our PSGR family and the animals that have found their way to Second Chance Ranch are very lucky rescues! PSGR is life changing, literally, for the animals we rescue. Even if they don't realize it, the rescue means everything to them and their second chance at life. PSGR means a lot to the people that cross paths with it as well. It's near impossible for this place, these animals, not have some impact on everyone who walks through our gate. Especially the core group of us who choose to spend the time that we do here. I often say that my work with PSGR is my therapy. It is my happy place. Yes, I am helping animals but just as much, they are helping me. They demonstrate unconditional love, trust, resilience, courage, forgiveness and so much more, every single day. Discovering this place and the work that Barbara does, I feel as though I have finally found what I am here on this earth to help do. I am grateful to be given the opportunity to be a part of what Barbara has created. I've discovered my true passion and will forever be grateful. The work is rewarding - to see a very ill animal recover, to see a happy family picking up their new family member, to hear back from them and see pictures of how well they are all doing. So much to be thankful for all around. Thankful the rescue is there for the animals; thankful for the dedication and hard work Barbara and the volunteers contribute to our little corner of the world; the thankful adoptive families, and the thanks from the people who contribute resources and money to the rescue. That surprised me the most, people thanking me for doing the work. It has meant a lot to me to help explain the mission of the rescue, to educate people about the reality of what has to happen to put meat on the table, to see the animals get well, to see peace come into their lives. Most of all I am thankful to be a part of it. We all have experiences from our time here that will stay with us forever. More memories and moments I am thankful for are made every time I walk through that gate. No post about gratitude would be complete without thanking the person at the heart of all of this, Barbara. She has dedicated her life to saving these animals and making their lives not only safe and healthy and happy, but possible. She has created a place that has not only saved thousands of goats and sheep and various other animals but she has also created a place of meaning and purpose for many animal loving people. Thank you Barbara, you are much loved by your PSGR family, 2 and 4 legged!